Anyone been joining in with the 30 day plank challenge?…. Phalakasana or ‘plank’ is probably the most recognisable position for most people when they enter their first yoga class. 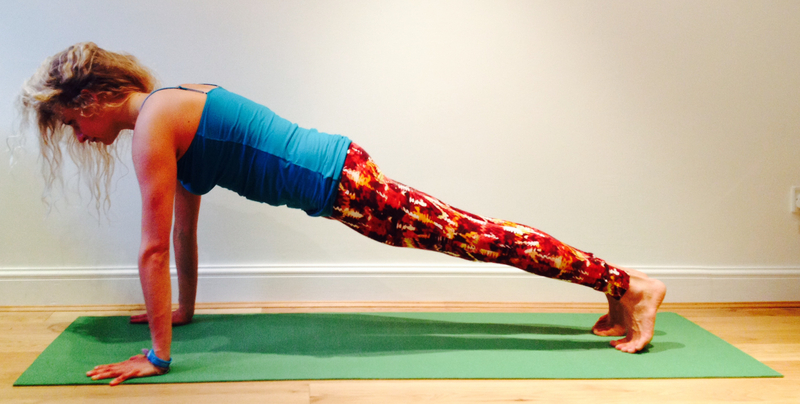 A brilliant core and upper body strengthener; this asana builds inner strength and willpower as we build up to being able to hold this posture regularly in class, or for a sustained amount of time. Commonly used in a ‘vinyasa’ sequence, which transitions through plank, chatturanga, upward facing dog, and downward facing dog between sequences in a continuous flowing movement; it’s worth practicing phalakasana and understanding the pose as we’re likely to be holding it often. There doesn’t need to be too much warming up for plank pose, but one of the most useful things to do before you practice this asana, is to stand in Tadasana (mountain pose). Feel the alignment of the ankles in line with the knees; knees in line with hips; hips level and in line with shoulders, the tailbone long and the navel drawn in and up strongly; the shoulder blades engaged and the chest open; the back of the neck long, with the crown of the head drawing straight up. This is the kind of alignment we can look for in our plank pose, and in many other postures actually – finding alignment through the body and visualising ‘Tadasana in every Asana’. If you want to prepare the body a little further; warm up the shoulders by wind-milling the arms around alternately, and then rotating the wrists to bring some awareness to that area. From an all-fours position, with the hands underneath the shoulders and knees underneath the hips; begin to cultivate the same feeling through the hands and arms that you would in downward facing dog…. So the fingertips and finger pads press down firmly on the mat. Feel that the middle of the palm of the hand is kind of like a suction cup – concentrating on drawing up through the hand. Rotate the upper arms as though you were trying to hide your armpits from the person next to you so the shoulder blades slide down the back, and maintain a broad chest. From there, tuck the toes under and straighten the legs out behind you. Now we focus on finding that Tadasana alignment again. So feel a long straight line all the way from the ankles, through the legs and knees, the hips, the body, the shoulders and the ears, and up through the crown of the head. *Make sure you’re keeping the back of the neck – and therefore the whole spine – nice and long, especially if you have a tendency to jut the chin forward. Draw the navel in and up strongly to engage the abdominals and keep the tailbone long – this will help to keep the alignment through the body and prevent the tendency some of us have of either sinking too low in the hips, or raising them up too high. If you’re familiar with ujjayi breath, now is the time to use it! Applying mula bandha by lifting the muscles of the pelvic floor will also help to bring extra strength and support to the posture. Stay here for 5-10 breaths, or maybe you fancy working your way gradually up to 5 minutes if you’re joining the plank challenge many people seem to have taken on! When you’ve finished practicing phalakasana, move through some gentle wrist therapy in a comfortable seated position. Remember; when we work with core strength in a yoga practice, think about shifting the focus away from ‘getting great abs’ and instead focus on the more important and longer-lasting aspect of building a deep sense of inner strength. Phalakasana is great for awakening the Manipura Chakra which we looked at earlier this week – representing empowerment, confidence and that all-important inner strength.